Transient increases in mitochondrially-derived reactive oxygen species (ROS) activate an adaptive stress response to promote longevity. Nicotinamide adenine dinucleotide phosphate (NADPH) oxidases produce ROS locally in response to various stimuli, and thereby regulate many cellular processes, but their role in aging remains unexplored. Here, we identified the C. elegans orthologue of mammalian mediator of ErbB2-driven cell motility, MEMO-1, as a protein that inhibits BLI-3/NADPH oxidase. MEMO-1 is complexed with RHO-1/RhoA/GTPase and loss of memo-1 results in an enhanced interaction of RHO-1 with BLI-3/NADPH oxidase, thereby stimulating ROS production that signal via p38 MAP kinase to the transcription factor SKN-1/NRF1,2,3 to promote stress resistance and longevity. Either loss of memo-1 or increasing BLI-3/NADPH oxidase activity by overexpression is sufficient to increase lifespan. Together, these findings demonstrate that NADPH oxidase-induced redox signaling initiates a transcriptional response that protects the cell and organism, and can promote both stress resistance and longevity. How reactive oxygen species (ROS) affect aging is a fundamental issue in biology (Back et al., 2012a; Krause, 2007; Hekimi et al., 2011; Ristow, 2014; Ristow and Schmeisser, 2014; Kawagishi and Finkel, 2014; Riera and Dillin, 2015; Durieux et al., 2011; Balaban et al., 2005; Melov, 2002; Shadel, 2014; Sena and Chandel, 2012). Chronic exposure to ROS leads to cellular damage and age-associated diseases, including Alzheimer’s disease, Parkinson’s disease, cancer, diabetes, cardiovascular diseases, and chronic inflammation. By contrast, low or acute ROS exposure mobilizes protective mechanisms and increases lifespan in S. cerevisiae (Pan et al., 2011; Mesquita et al., 2010; Schroeder et al., 2013), D. melanogaster (Albrecht et al., 2011), C. elegans (Schulz et al., 2007; Doonan et al., 2008; Yang and Hekimi, 2010; Schmeisser et al., 2013; Lee et al., 2010), and rodents (Lapointe and Hekimi, 2008; Liu et al., 2005), and has been associated with health benefits in humans (Ristow et al., 2009, 2014). This phenomenon is conceptualized as mitochondrial hormesis or mitohormesis (Ristow and Schmeisser, 2014). Hormesis is defined as the induction of protective mechanisms under exposure to low doses of stressful agents, which at higher or prolonged exposures are harmful. Ninety percent of cellular ROS arise as a by-product of mitochondrial oxidative phosphorylation (Halliwell and Gutteridge, 2007). Moderate mitochondrial dysfunction leads to elevation of mitochondrial-derived ROS, activating protective mechanisms (mitohormesis) and promoting longevity (Ristow and Schmeisser, 2014). Several longevity interventions, such as dietary restriction or reduced insulin/IGF-1 signaling, are associated with an increase in mitochondrial ROS levels, which acts as a retrograde signal to increase lifespan (Schulz et al., 2007; Weimer et al., 2014; Zarse et al., 2012). One mechanism by which ROS affect cellular signaling is by specifically and reversibly reducing/oxidizing reactive thiol-groups on cysteine residues, thereby modifying protein functions, which is also known as redox signaling. For instance, ROS promote receptor tyrosine kinase (RTK) signaling by oxidizing a cysteine residue in protein-tyrosine phosphatase 1 (PTP1), thereby transiently inactivating its phosphatase activity (Salmeen et al., 2003; Goldstein et al., 2005) and potentiating the activity of its partner RTK. Localized ROS that act as signals do so at short range (~5–20 µm; [Winterbourn, 2008]) with a half-life of ~1 ms (D'Autréaux and Toledano, 2007), in part due to high intracellular concentration of the antioxidant glutathione (1–10 mM; [Meister, 1988]), which keeps the cytosol in a reduced environment (Gilbert, 1990; Romero-Aristizabal et al., 2014; Lambeth and Neish, 2014). Hence, pools of localized ROS must be rapidly generated for redox signaling to occur. In addition to ROS derived as a by-product of mitochondrial oxidative phosphorylation, cells have membrane-associated enzymes that generate ROS, using nicotinamide adenine dinucleotide phosphate (NADPH) as an electron donor to produce a local ROS micro-environment (Bedard and Krause, 2007). In general, NADPH oxidases form complexes with subunits required for their stability and activation (Bedard and Krause, 2007). For instance, upon stimulation of cell surface receptors, guanosine-trisphospate (GTP) bound Rho-guanosine-triphosphatase (GTPase) family members and p21-activated kinase-1 (PAK1) must be recruited to the NADPH oxidase complex to generate ROS (Hurd et al., 2012). Mammals have seven NADPH oxidase family members, which have been found in almost every tissue and are localized at cellular membranes and within intracellular compartments, such as endosomes and endoplasmic reticulum (ER) (Bedard and Krause, 2007; Krause, 2007). Mammalian NADPH oxidases have been implicated in a wide range of normal physiological functions, (Bedard and Krause, 2007; Krause, 2007), as well as in diseases that include cancer (Truong and Carroll, 2012). NADPH oxidase-generated ROS have been shown to act as a second messenger to regulate migration of metastasis-committed-cancer cells and as a chemoattractant for immune cells during wound healing (Stanley et al., 2014; Hurd et al., 2012). 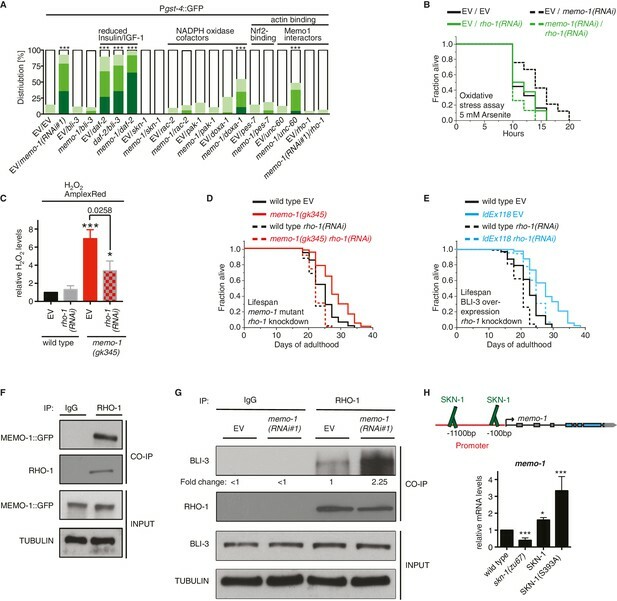 Mediator of ErbB2 driven cell motility (Memo1) has been shown to play an important role in migration of breast cancer cells and is needed for robust metastatic dissemination from primary tumors to lungs (Marone et al., 2004; MacDonald et al., 2014). During the migratory process Memo1 interacts with Rho GTPase to dynamically reorganize actin and microtubule fibers (Zaoui et al., 2008), and has also been linked to NADPH oxidase activity in breast cancer cells (MacDonald et al., 2014). However, whether NADPH oxidase generated ROS have a biological function during aging is unknown. Here, we used the model organism Caenorhabditis elegans to investigate the role of NADPH oxidase generated ROS in aging. The nematode C. elegans provides the advantages of genetic tractability, and of being transparent that allows in vivo non-invasive visualization of transgenic fluorescent probes that measure ROS levels (Back et al., 2012b). Moreover, C. elegans has a short lifespan, making it ideal to gain mechanistic insights into the aging process. We found that loss of the C. elegans memo-1/C37C3.8 leads to elevated ROS levels generated by BLI-3/NADPH oxidase, which activates an adaptive detoxification system regulated by the transcription factor SKN-1/Nrf1,2,3 in promoting organismal-wide oxidative stress resistance and longevity. The nematode C. elegans encodes a gene (C37C3.8) that shares 153 out of 297 amino acids (52%) identity with human Memo1 (Figure 1—figure supplement 1A), which we named memo-1 (Mediator of ErbB2-driven cell motility-like protein; wormbase.org). The C. elegans memo-1 gene product is expressed in the embryo and larval stages and through adulthood in many neuronal and non-neuronal cells in the head and tail, spermatheca, distal tip cells, anchor cell, and intestine (jxEx8 [Pmemo-1::GFP] and ldEx112 [MEMOfosmid::GFP]; Figure 1A and Figure 1—figure supplement 1B–I). To gain insight into the biological function of memo-1 in C. elegans, we took a reverse genetics approach using memo-1 RNA interference (memo-1(RNAi)) or memo-1(gk345) putative null mutants (memo-1(-); Figure 1B) and measured longevity. Both memo-1(RNAi)) and memo-1(gk345) mutants showed a 7–38% increase in lifespan compared to wild type (Figure 1C, Supplementary file 1). We also tested these mutants for several pathways related to Memo1 activities in vertebrates (Sorokin and Chen, 2013; Marone et al., 2004), which include phenotypes linked to the epidermal growth factor receptor (EGFR) and insulin/IGF-1 receptors (Figure 1—figure supplement 2E), and to cell migration (Figure 1—figure supplement 2F–J). We found that memo-1(-) mutants behaved like the wild-type strain. To exclude any developmental effects of memo-1 loss, we treated wild-type animals with memo-1(RNAi) starting from the first day of adulthood and showed that this was sufficient to increase lifespan (Figure 1D and Supplementary file 1). Loss of memo-1 leads to increased ROS. 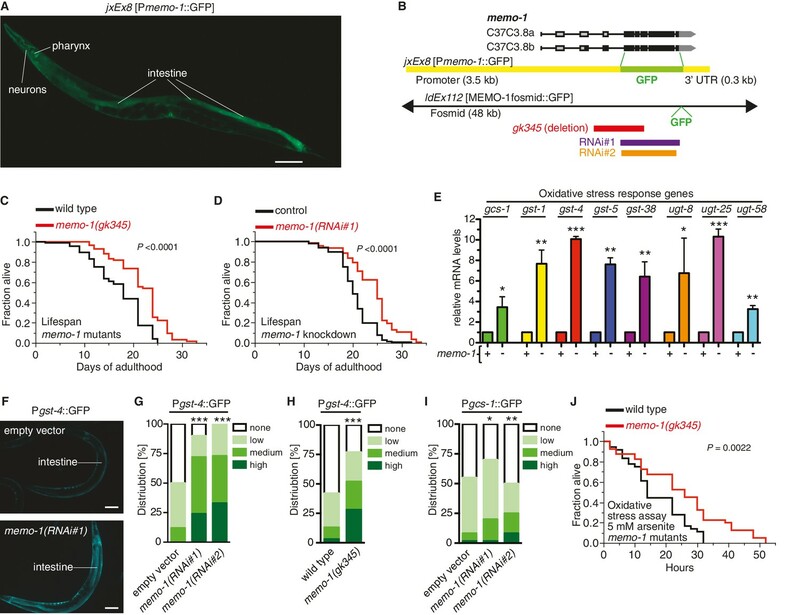 (A) Transcriptional fusion of the memo-1 promoter (Pmemo-1) with GFP (jxEx8 [Pmemo-1::GFP]) shows that memo-1 is expressed in neurons, pharyngeal cells, and intestine in adult C. elegans. Anterior to the left, ventral side down. Scale bar = 100 µm. (B) Genomic organization of the C37C3.8 (memo-1) locus (gray is untranslated UTR; black are translated exons; adapted from wormbase.org). The memo-1 gene encodes two isoforms (C37C3.8a and C37C3.8b), whereby C37C3.8b is predicted to be 48 amino acids longer than C37C3.8a (297 amino acids). The gk345 allele (red) is a 915 bp deletion. RNAi#1 clone (purple) and RNAi#2 clone (orange) are from Vidal- and Ahringer RNAi libraries, respectively. See Materials and methods for more details. (C) memo-1(gk345) mutants show a 27% increase in mean lifespan compared to wild type (N2) at 20°C. P value determined by log-rank. Statistics and additional lifespan data are in Supplementary file 1. (D) Knockdown of memo-1(RNAi#1) starting on the first day of adulthood in RNAi-sensitive animals (rrf-3(pk1426)) increases mean lifespan by 20% compared to empty RNAi vector control (L4440) at 20°C. P value determined by log-rank. Statistics and additional lifespan data are in Supplementary file 1. (E) memo-1(RNAi#2) treated wild type (N2) (-) have higher mRNA expression levels of the oxidative stress response genes, such as glutamine cysteine synthetase (gcs-1), glutathione-S-transferase (gst-1, 4, 5, 38), and uridine 5'-diphospho-glucuronosyltransferase (ugt-8, 25, 58), compared to empty vector treated wild type (N2) (+), determined by qRT-PCR. 3 replicates of >1000 mixed staged worms per condition were analysed. Data are represented as mean ± s.e.m. P value * <0.05, ** <0.001, *** <0.0001 relative to wild type or control, by one sample t-test, two-tailed, hypothetical mean of 1. (F–I) Loss of memo-1 increases the expression of oxidative stress response genes gst-4 and gcs-1 in the intestine. (F) shows representative pictures of dvIs19 [Pgst-4::GFP] transgenic adult C. elegans treated with empty vector (upper picture; category: none) or memo-1(RNAi#1) (lower picture; category: high). Anterior to the right, ventral side up. Scale bar = 100 µm. (G–I) Quantification of transgenic worms containing the promoter of gst-4 or gcs-1 fused with GFP (dvIs19 [Pgst-4::GFP] and ldIs003 [Pgcs-1::GFP]. Scoring is described in Material and methods. Three trials are shown with N > 60 for each condition and trial. P value by chi2 (* <0.05; ** <0.001; ***p<0.0001). (J) Survival of one-day old adult memo-1(gk345) mutants or wild type (N2) in sodium arsenite (5 mM) was assayed. P value determined by log-rank. Statistics and additional oxidative stress data either with arsenite or tert-butyl hydrogen peroxide are shown in Supplementary file 2. Dietary restriction extends lifespan across essentially all eukaryotes (Kenyon, 2010). Since MEMO-1 is expressed around the pharynx (Figure 1—figure supplement 1C), an organ that regulates food intake, we measured pharyngeal pumping rates of memo-1(-) mutants, finding them to be similar to those of wild type (Figure 1—figure supplement 3A). Reducing germline stem cell number also increases C. elegans’ lifespan (Hsin and Kenyon, 1999) and MEMO-1 is expressed in cells associated with the germline (Figure 1—figure supplement 1F and H). However, memo-1(-) mutants did not show germ-line defects (Figure 1—figure supplement 2F and G). Not only did they have a normal brood size (Figure 1—figure supplement 3B), they also showed no upregulation of genes implicated in reduced germline stem cell-mediated longevity (Figure 1—figure supplement 3C). To identify cellular processes that promote the memo-1(-)-longevity phenotype, we performed quantitative RT-PCR on selected target genes involved in known longevity-promoting processes, comparing memo-1(-) mutants with wild type (Figure 1—figure supplement 3C–G). We concentrated on stress response pathways, since longevity frequently correlates with increased stress resistance (Shore and Ruvkun, 2013). Several genes involved in the oxidative stress response were strongly upregulated (3–10 fold) in the memo-1 mutants or by memo-1(RNAi), compared to wild type or empty vector control strains (Figure 1E–I, Figure 1—figure supplement 3G). By contrast, genes involved in the heat shock response, the unfolded protein response (UPR) and other longevity-promoting processes were not altered in memo-1(-) animals (Figure 1—figure supplement 3C and E). Importantly, downregulation or loss of memo-1 by RNAi or mutation increased oxidative stress resistance, correlating with the observed changes in gene expression (Figure 1J, Supplementary file 2). By contrast, its loss did not increase resistance to heat shock (Figure 1—figure supplement 3H). Taken together, these results suggest that a elevated oxidative stress resistance might be an important factor in memo-1(-)-longevity. The major oxidative stress response is orchestrated by the transcription factor SKN-1, a homologue of the NRF1/2/3 (Nuclear factor-erythroid-related factor) bZIP transcription factor family (An and Blackwell, 2003). Several of the oxidative stress response genes that are upregulated by memo-1 knockdown or mutation are direct transcriptional targets of SKN-1 (Figure 2—source data 1). Thus, we examined the role of skn-1 in the memo-1 phenotype. Knockdown of skn-1 by RNAi abolished the longevity phenotype of memo-1(-) mutants (Figure 2A; Supplementary file 1). Conversely, memo-1(RNAi) knockdown increased lifespan of wild-type animals but not of skn-1(-) mutants (Figure 2B; Supplementary file 1). These results suggest that the extended lifespan of animals that lack memo-1 is mediated through SKN-1. The oxidative stress response pathway is activated and is required for memo-1(-) mediated longevity and oxidative stress resistance. (A) Knockdown of skn-1 starting on the first day of adulthood abolishes the increased lifespan of memo-1(gk345) mutants. For statistical details and additional lifespans see Supplementary file 1. (B) Knockdown of memo-1(RNAi#1) starting on the first day of adulthood increases lifespan of wild type (N2) animals, but failed to increase lifespan of skn-1(zu67) loss-of-function mutants. For statistical details and additional strains see Supplementary file 1. (C) Schematics and representative pictures of transgenic L4 animals expressing a translational fusion of SKN-1 protein tagged with GFP (ldIs007 [SKN-1::GFP]), treated either with empty vector (upper picture; no SKN-1::GFP in intestine = score none) or memo-1(RNAi#1) (bottom picture; SKN-1::GFP in all intestinal nuclei = score high). Scale bar = 20 µm. Triangles indicate intestinal nuclei. (D) Quantification of SKN-1::GFP in L4 transgenic animals: Knockdown of memo-1(RNAi #1 or #2) starting from the egg stage induced translocation of SKN-1::GFP into the intestinal nuclei. N > 60, three merged trials. *** <0.0001 P values were determined by Chi2 test. Scoring is described in Material and Methods. (E) p38 mitogen-activated protein kinase is phosphorylated (P-p38 MAPK) upon oxidative stress (WT arsenite; 5 mM sodium arsenite for 10 min) or in untreated memo-1(gk345) mutants, compared to untreated wild type (WT untreated). (F) Knockdown of memo-1(RNAi #1 or #2) for two generations led to an increase p38 phosphorylation levels compared to empty RNAi vector control wild type animals. For (E–F) Total extracts from >1000 L4 animals in each condition were analyzed by western for levels of P-p38. Actin was used as a loading control. Fold change indicates the relative P-p38 MAPK to actin levels compared to control (E: WT untreated; F: WT empty RNAi vector control). (G) Knockdown of memo-1(RNAi#1) starting on the first day of adulthood increases lifespan of wild type (N2) animals, but failed to increase lifespan of sek(km4) loss-of-function mutants. For statistical details and additional trials see Supplementary file 1. (H) Schematic of the oxidative stress response pathway in C. elegans. Oxidative stress activates SEK-1/MAPKK phosphorylating p38 MAPK phosphorylating the SKN-1/Nrf transcription factor, promoting its nuclear translocation, which initiates transcription of oxidative stress response genes (e.g., gcs-1 and gst-4). To determine whether loss of memo-1 activates SKN-1, we examined the cellular localization of GFP-tagged SKN-1. Under normal conditions SKN-1 is largely retained in the cytoplasm; following oxidative stress, SKN-1 accumulates in the nucleus to initiate transcription of target genes (An and Blackwell, 2003). RNAi-mediated memo-1 knockdown caused a significant increase in nuclear SKN-1::GFP (Figure 2C and D). Under oxidative stress conditions, SKN-1 phosphorylation/activation is mediated by p38 mitogen-activated protein kinase (MAPK; [Inoue et al., 2005]), which is phosphorylated and activated by SEK-1/MAPKK (Inoue et al., 2005; Hourihan et al., 2016). 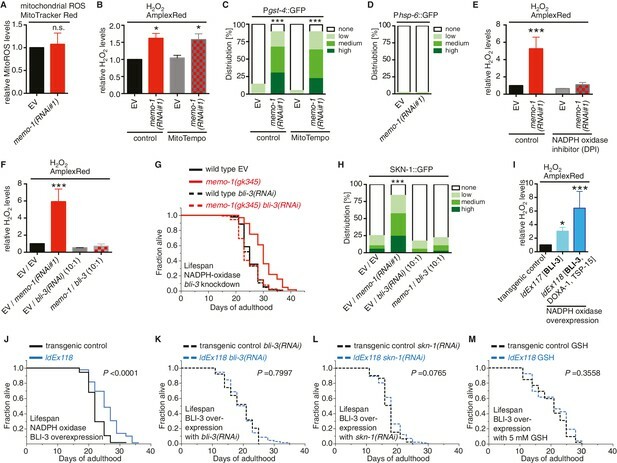 Importantly, reducing memo-1 function either by RNAi or mutation resulted in higher levels of phospho-p38 MAPK (Figure 2E and F), and loss of sek-1 completely abolished memo-1(-) mediated-longevity (Figure 2G). Since sek-1 and skn-1 are important for the defense against pathogenic bacteria (Hoeven et al., 2011), and bacterial proliferation in the C. elegans’ intestine contributes to death of the animal (Garigan et al., 2002), we investigated the lifespan of memo-1 mutants on heat-killed bacteria. We found that memo-1 mutants remain long-lived compared to wild type (Supplementary file 1). 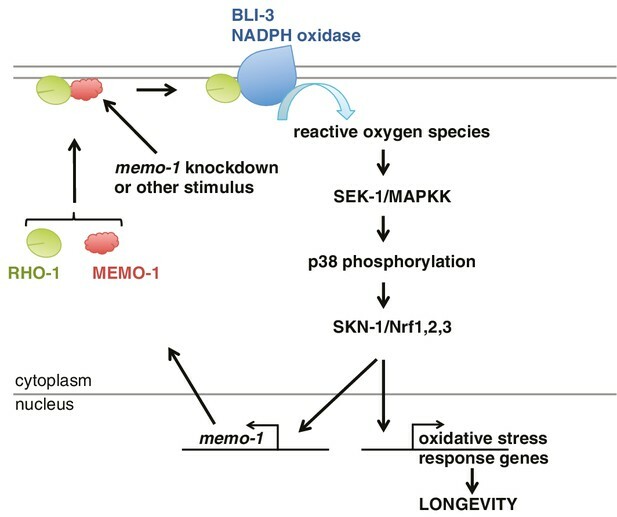 Taken together, these results show that memo-1 loss stimulates the p38 MAPK oxidative stress response pathway (Figure 2H), which is required for the longevity phenotype. The increase in the oxidative stress response pathway observed in the preceding experiments suggested that ROS levels might be altered in memo-1 animals. To examine this, we measured intracellular ROS in living worms using a diffusible fluorescent probe (chloromethyl derivative CM-H2DCFDA) and observed a 2-fold increase upon treatment of wild-type C. elegans with memo-1(RNAi) (Figure 3A). Moreover, compared to control worms, transgenic worms that express the HyPer sensor (jrIs1 [Back et al., 2012b]) and have been treated with memo-1(RNAi) have a 5-fold increase in endogenous hydrogen peroxide levels (Figure 3B), while memo-1 mutant or RNAi-treated animals have a 2-fold increase in hydrogen peroxide, according to the fluorescent probe AmplexRed (Figure 3C and D). Interestingly, ROS levels in the memo-1(RNAi) and the memo-1(RNAi); sek-1(RNAi) animals were elevated to a similar level (Figure 3E and Figure 3—figure supplement 1A and B), suggesting that the SKN-1 adaptive response did not necessarily reduce the overall ROS load. Additionally, memo-1(-)-impaired animals that lack ROS protection in a skn-1(-) (Figure 2B) or sek-1(-) mutant background (Figure 2G) did not live shorter than either skn-1(-) or sek-1(-) single mutants in the absence (Figure 2B and G) or presence of the oxidative stress-inducing agent 5 mM arsenite (Supplementary file 1 and 2). Taken together, these results suggest that the increased ROS levels in animals that lack memo-1 are not necessarily detrimental. Increased ROS resulting from loss of memo-1 function is required for longevity. (A) Knockdown of memo-1 increases endogenous ROS levels in vivo, measured using the CM-H2DCFDA fluorescent molecular probe. (B) Knockdown of memo-1 increases endogenous hydrogen peroxide levels, measured in transgenic HyPer worms (jrIs1[Prpl-17::HyPer]), to a similar extent as measured in EV fed animals treated with 5 mM sodium arsenite for 10 min (EV and arsenite). (C–D) Knockdown of memo-1 (C) and memo-1(gk345) mutants (D) have higher hydrogen peroxide levels in vivo compared to wild type (N2) control, as measured with AmplexRed. (E) Knockdown of sek-1 does not suppress the higher hydrogen peroxide levels induced by memo-1(RNAi) measured with AmplexRed. (F) Loss of sek-1 completely suppresses the memo-1(-) mediated oxidative stress resistance. For statistical details and additional trials see Supplementary file 2. (G) Treatment with the antioxidant glutathione (GSH) completely suppresses the higher endogenous hydrogen peroxide levels of transgenic HyPer worms (jrIs1[Prpl-17::HyPer]) treated with memo-1(RNAi) or by measurement with Amplex Red (Figure 3—figure supplement 1C). Eggs were hatched on empty vector (EV) or memo-1(RNAi) food with 5 mM GSH or with solvent (H2O; control) and harvested for assay at larval stage 4 (L4). (H) The antioxidant glutathione (GSH) completely suppresses the longevity of memo-1(gk345) mutants. For statistical details and additional trials with memo-1(RNAi) see Supplementary file 1. (I) The antioxidant glutathione (GSH) completely suppresses the induction of oxidative stress response gene gst-4 in response to memo-1 knockdown. Transgenic animals dvIs19 [Pgst-4::GFP] were placed on empty vector (EV) or memo-1(RNAi) food with 5 mM GSH or solvent (H2O; control) for two generations and day one adults were scored. N > 60, three merged trials. *** <0.0001 P values were determined by Chi2 test. Scoring is described in Material and methods. For (A–C, E) Eggs were hatched on empty vector (EV) or memo-1(RNAi) food and harvested for the assay at larval stage 4 (L4). For (A–E, G) N > 1000 for each condition, three merged trials. All data are represented as mean ± s.e.m. P values * <0.05 relative to wild-type on EV or (D) to wild type (N2), determined by one sample t-test, two-tailed, hypothetical mean of 1. An intriguing possibility suggested by the data is that memo-1(-)-induced ROS might have longevity-promoting activities analogously to mitochondrially-derived ROS. To investigate this hypothesis, we neutralized memo-1(RNAi)-produced ROS by treatment with the antioxidant glutathione (GSH) (Figure 3G and Figure 3—figure supplement 1C). GSH treatment during adulthood had no effect on wild-type lifespan, but abolished memo-1(-)-induced longevity (Figure 3H, Supplementary file 1), suggesting an essential role for memo-1(-)-induced ROS in this process. Furthermore, GSH treatment abolished the induction of the SKN-1 target gene gst-4 (Figure 3I), indicating that the memo-1(RNAi)-induced ROS are responsible for SKN-1 activation. SKN-1 has been implicated in ROS-induced hormesis and ROS signaling (Blackwell et al., 2015). Indeed, mitochondrially-generated ROS have been observed to increase lifespan via SKN-1 (Schmeisser et al., 2013a; Weimer et al., 2014; Schmeisser et al., 2013b; Hunt et al., 2011). To determine if excess ROS in memo-1(-) mutants are generated from mitochondria, we used a specific mitochondrial ROS-detecting reagent, MitoTracker Red CM-H2X (Weimer et al., 2014), revealing that the memo-1(RNAi) animals had similar mitochondrial ROS levels as the controls (Figure 4A). Furthermore, a mitochondria specific-antioxidant, MitoTEMPO, neither suppressed the higher ROS levels nor elevated the gst-4 expression levels (Figure 4C) seen in memo-1(RNAi)-treated animals (Figure 4B and Figure 3—figure supplement 1A). The level of hsp-6 expression, a measure of the mitochondrial unfolded protein response and of high mitochondrial ROS levels (Runkel et al., 2013), remained at control levels in memo-1(RNAi) animals (Figure 4D). 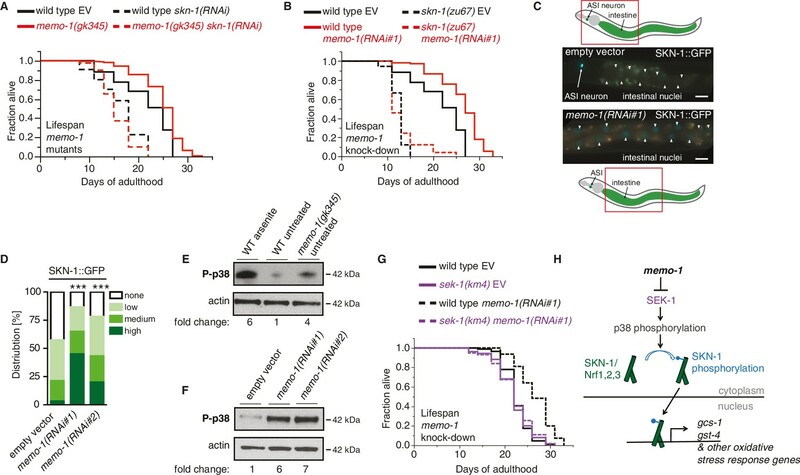 Moreover, the longevity of memo-1(RNAi) treated animals was additive to the longevity of electron transport chain mitochondrial mutant isp-1(qm150) (Supplementary file 1). Lastly and importantly, a low dose of mitochondrial ROS require sod-3 (superoxide dismutase) for extending lifespan (Yee et al., 2014) and memo-1(-) longevity is independent of sod-3 (Supplementary file 1). Taken together, these data show that the memo-1(-) induced ROS are not generated by the mitochondria. Loss of memo-1 increases ROS via NADPH oxidase to extend lifespan. (A) Knockdown of memo-1 does not increase mitochondrial localized ROS levels in vivo, measured with MitoTracker Red CM-H2XRos fluorescent molecular probe. In a parallel experiment, the same memo-1(RNAi) treatment was sufficient to increase hydrogen peroxide, as measured by Amplex Red (Figure 3—figure supplement 1A and Figure 4—figure supplement 1). (B) The mitochondrial specific antioxidant MitoTempo did not suppress memo-1(RNAi) induced ROS, measured with Amplex Red. (C) The mitochondrial specific antioxidant MitoTempo did not suppress memo-1(RNAi)) induced expression of gst-4 (dvIs19 [Pgst-4::GFP]). N > 60, three merged trials. *** <0.0001 P values were determined by Chi2 test. Scoring is described in Material and methods. (D) The mitochondrial stress response gene hsp-6 (zcIs13 [Phsp-6::GFP]) was not induced by memo-1(RNAi). N > 100 for each condition, three merged trials. As a control and run in parallel, memo-1(RNAi) was sufficient to increase Pgst-4::GFP expression (Figure 5—figure supplement 1B). (E) A short (15 min) treatment with the NADPH oxidase inhibitor Diphenyleneiodonium (DPI) completely suppressed the elevated hydrogen peroxide levels of wild-type worms treated with memo-1(RNAi). (F) Knockdown of bli-3/ NADPH oxidase completely suppressed the elevated hydrogen peroxide levels of wild-type worms treated with memo-1(RNAi). As reported in Chávez et al. (2009), a 1:10 ratio for the double RNAi treatment with bli-3 was used because of the strong bli-3 blistering phenotype. For corresponding experiments with transgenic HyPer worms (jrIs1[Prpl-17::HyPer]), see Figure 3—figure supplement 1D. (G) Adulthood specific knockdown of bli-3/ NADPH oxidase (undiluted RNAi) completely suppressed the longevity of memo-1(gk345) mutants. For statistical details and additional trials see Supplementary file 1. (H) Knockdown of bli-3/ NADPH oxidase completely suppressed memo-1(RNAi) induced nuclear translocation of SKN-1 protein (ldIs007 [SKN-1::GFP]). N > 60, three merged trials. *** <0.0001 P values were determined by Chi2 test. Scoring is described in Material and methods. (I) Transgenic worms overexpressing BLI-3 (ldEx117) alone, or triple transgenic worms (ldEx118) overexpressing BLI-3 and co-factors for NADPH oxidase complex maturation and stability (DOXA-1 and TSP-15; [Moribe et al., 2012]) showed an increased hydrogen peroxide level compared to control transgenic animals. Mixed stage worms, N > 1000 for each condition, three merged trials. All data are represented as mean ± s.e.m. P values * <0.05 or *** <0.0001 relative to transgenic control (ldEx102) were determined by one sample t-test, two-tailed, hypothetical mean of 1. (J–M) Triple transgenic worms (ldEx118) overexpressing BLI-3, DOXA-1, TSP-15 showed an increased lifespan compared to transgenic control (ldEx102). The increased lifespan was dependent on bli-3 (K), skn-1 (L), and ROS (M). (J–M) are from the same trial (Supplementary file 1). P-value determined by log-rank. Overexpression of BLI-3 alone (ldEx117) was also sufficient to increase lifespan (Supplementary file 1). For statistical details and additional trials see Supplementary file 1. For (A, B, E, F) eggs were hatched on empty vector (EV) or memo-1(RNAi) (or double RNAi with a ratio 1:1, except where indicated) food, and harvested for assay at larval stage 4 (L4). N > 1000 for each condition, three merged trials. All data are represented as mean ± s.e.m. P values * <0.05 or *** <0.0001 relative to wild-type on EV were determined by one sample t-test, two-tailed, hypothetical mean of 1. The nicotinamide adenine dinucleotide phosphate oxidases (NADPH oxidase) are important sources of intracellular ROS (Krause, 2007). To check if they have a role in ROS production in memo-1(RNAi)-animals, we treated these animals with diphenyleneiodonium (DPI), a general inhibitor of NADPH oxidase activity (Stuehr et al., 1991). DPI treatment completely eliminated memo-1(RNAi)-induced ROS (Figure 4E). The C. elegans genome encodes two NADPH oxidase (NOX)-related genes, Duox1/BLI-3 and Duox2. NOX proteins contain an NADPH oxidase domain, while DUOX proteins possess an additional peroxidase domain. Duox2 is not expressed in adult C. elegans, while BLI-3 is mainly expressed and functional in the intestine and hypodermis (Edens et al., 2001; Chávez et al., 2009). Importantly, knocking down bli-3 completely eliminated memo-1(-)-induced ROS (Figure 4F and Figure 3—figure supplement 1D), suggesting that this dual oxidase is required for ROS generation in the memo-1(-) animals. Next we examined the role of BLI-3 in the memo-1(-)-induced phenotype. Adult-specific knockdown of bli-3 did not alter wild-type lifespan or longevity resulting from dietary restriction, reduced insulin/IGF-1 signaling or reduced mitochondrial electron transport chain activity (Supplementary file 1), but it completely eliminated the memo-1(-) longevity phenotype (Figure 4G and Supplementary file 1). Consistent with this, bli-3 knockdown suppressed SKN-1 nuclear localization in memo-1(RNAi) animals (Figure 4H), suggesting that BLI-3-generated ROS signal to SKN-1. Conversely, overexpression of BLI-3 alone, or with its maturation/association partners DOXA-1 and TSP-15 (Moribe et al., 2012), was sufficient to generate higher ROS levels (Figure 4I) and to increase lifespan (Figure 4J and Supplementary file 1), which was reduced by bli-3 (RNAi) (Figure 4K and Supplementary file 1). BLI-3-dependent longevity (Figure 4J and Supplementary file 1) required SKN-1 (Figure 4L and Supplementary file 1), and was suppressed by the antioxidant GSH (Figure 4M and Supplementary file 1). Taken together, these results suggest that MEMO-1 functions as an inhibitor of BLI-3; and elevated ROS in the absence of MEMO-1 confers an enhanced longevity phenotype. This is a novel function for the NADPH oxidase BLI-3, which is known to produce ROS for innate immune functions (Chávez et al., 2009). Loss of memo-1 increases expression of the SKN-1-target gene gst-4 in a bli-3-dependent manner (Figure 5A). By contrast, reduction of insulin/IGF-1 receptor signaling by daf-2(RNAi), which induces gst-4 via SKN-1 (Ewald et al., 2015; Tullet et al., 2008), was not blocked by bli-3(RNAi) (Figure 5A bars 5–7). These findings would suggest that MEMO-1 and DAF-2 act in parallel to each other. MEMO-1 inhibits NADPH oxidase via RHO-1/GTPase. (A) Summary of the targeted RNAi screen using the SKN-1 target gene gst-4 expression (dvIs19 [Pgst-4::GFP]) as a read-out for memo-1(-) induced NADPH oxidase activity. N > 60, three merged trials. *** <0.0001 P values were determined by Chi2 test. For individual trials see Figure 5—figure supplement 1. Scoring is described in Material and methods. (B) Loss of rho-1 completely suppresses the memo-1(-) mediated oxidative stress resistance. For statistical details see Supplementary file 2. (C) Knockdown of rho-1 lowered the memo-1(-) mediated ROS induction in all three independent biological trials. Eggs were hatched on empty vector (EV) or rho-1(RNAi). All data are represented as mean ± s.e.m. P values * <0.05 and *** <0.0001 relative to wild type EV control were determined by one sample t-test, two-tailed, hypothetical mean of 1. The memo-1(gk345) mutants treated with rho-1(RNAi) was compared to the memo-1(gk345) mutants treated with EV using paired t-test, one-tailed. (D) The longevity of memo-1(gk345) mutants was completely suppressed by adulthood specific knockdown of rho-1. For statistical details see Supplementary file 1. (E) The longevity of triple transgenic worms (ldEx118) overexpressing BLI-3, DOXA-1, TSP-15 was partially suppressed by adulthood specific knockdown of rho-1. For statistical details see Supplementary file 1. (F) MEMO-1 physically interacts with RHO-1 under wild-type conditions. Lysates from MEMO-1::GFP expressing animals ldEx112 [MEMOfosmid::GFP] were subjected to immunoprecipitations with a C. elegans specific RHO-1 antiserum and immunoblotted with a GFP antibody following SDS-PAGE. (G) Knockdown of memo-1 enhances the physical interaction of RHO-1 with BLI-3. Endogenous RHO-1 was immunoprecipited from lysates of wild type worms fed either EV or memo-1(RNAi) using RHO-1 antibody and was immunoblotted with BLI-3 antiserum. The relative BLI-3 levels in Co-IP samples to input samples is expressed as a fold change of memo-1(RNAi) to the empty vector control (EV). (H) Feedback loop: The memo-1 promoter contains four predicted SKN-1 binding sites (wormbase.org). In a genome-wide screen, transgenic SKN-1::GFP showed a high signal on two skn-1-binding sites in the memo-1 promoter region (upper panel; [Niu et al., 2011]). 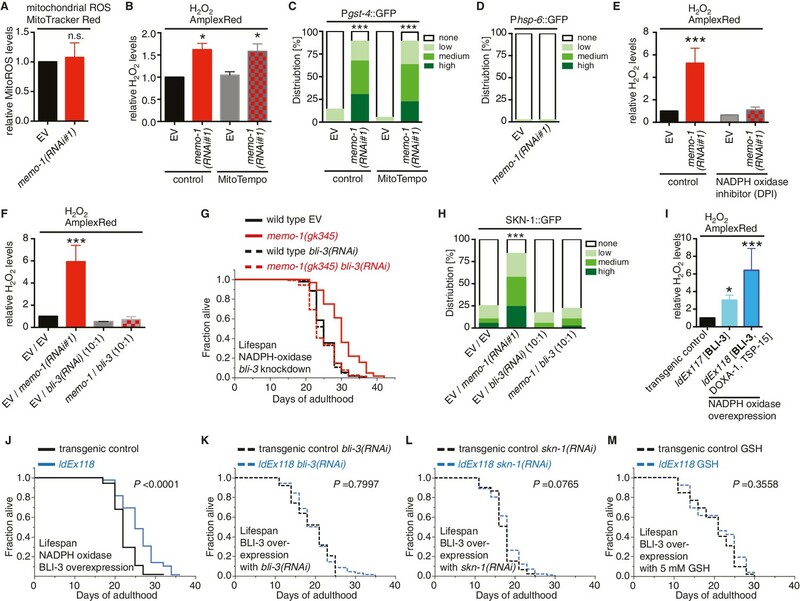 Lower panel shows that the memo-1 mRNA levels are lower in skn-1(zu67) loss-of-function mutants and higher in conditions of SKN-1 overexpression (ldIs007 [SKN-1::GFP]) and constitutively nuclear SKN-1 overexpression (ldIs020 [SKN-1S393::GFP]; [Tullet et al., 2008]) in transgenic animals, compared to wild type (N2), determined by qRT-PCR. Three biological samples of each 100 L4 worms per strain per trial. Data are represented as mean ± s.e.m. P value * <0.05, ** <0.001, *** <0.0001 relative to wild type or control, by one sample t-test, two-tailed, hypothetical mean of 1. To determine how MEMO-1 inhibits BLI-3 activity, we took a genetic approach. Loss of genes that are required for the downstream signaling in memo-1(-) animals should also eliminate gst-4 upregulation in a manner similar to bli-3 knockdown (Figure 5A). Therefore, we performed a targeted RNAi screen on selected genes. We screened genes that are known to activate NADPH oxidase, as well as genes that either interact with, or might potentially interact with MEMO-1 (Figure 5—figure supplement 1A–F). In this screen, we identified known activators of mammalian NADPH oxidases, such as rac-2, a Rho family GTPase, pak-1, the p21-activated kinase (Stanley et al., 2014; Hurd et al., 2012), doxa-1, the C. elegans BLI-3 maturation factor (Moribe et al., 2012), pes-7/IQGAP, the actin-binding Rho GTPase activator and NRF2 binding partner (Kim et al., 2013), and two interactors of mammalian Memo1: the actin-binding depolymerizing factor unc-60/cofilin (Meira et al., 2009) and the homologue of the mammalian RhoA GTPase rho-1 (Stanley et al., 2014). In mammalian models, it has been shown that RhoA interacts with Memo1 in pull-down assays (Zaoui et al., 2008). Moreover, ectopic expression of a gain-of-function mutant RhoA (V14) rescued breast cancer cells from migration-related defects (Zaoui et al., 2008). Thus, in the following experiments we concentrated on the MEMO-1/RHOA interaction in worms. To test whether C. elegans rho-1 is required for memo-1(-)-induced oxidative stress resistance, we knocked-down rho-1 in memo-1(RNAi) animals, which resulted in complete elimination of their oxidative stress resistance (Figure 5B and Supplementary file 2). Knocking down rho-1 in memo-1(gk345) mutants partially suppressed the memo-1(-) ROS induction (Figure 5C). 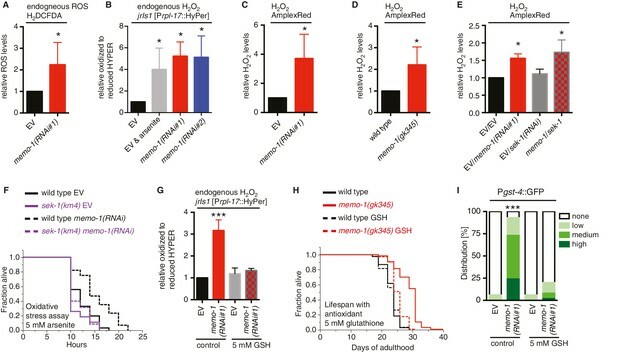 Moreover, adult-specific knockdown of rho-1 completely suppressed the longevity of memo-1(gk345), and partially blocked the lifespan extension from BLI-3 overexpression (Figure 5D and E and Supplementary file 1). Next, we examined whether MEMO-1 and RHO-1 physically interact in C. elegans lysates, by performing co-immunoprecipitation (Co-IP) of endogenous RHO-1 followed by immunoblot analysis of GFP-tagged MEMO-1. Under normal conditions, MEMO-1 and RHO-1 are found in a complex (Figure 5F). Since loss of memo-1 in C. elegans leads to higher ROS levels that are dependent on the NADPH oxidase BLI-3, we tested whether RHO-1 and BLI-3 also interact using lysates from control and memo-1-impaired animals. Co-immunoprecipitation with a RHO-1 antibody revealed that under normal conditions endogenous RHO-1 physically binds to endogenous BLI-3 in vivo. However, we found 2.25-fold higher levels of the BLI-3 bound to RHO-1 in lysates from memo-1 knockdown worms (Figure 5G). These findings suggest that MEMO-1 regulates the RHO-1/BLI-3 interactions necessary for BLI-3 function, a model that is consistent with our genetic findings. Interestingly, the memo-1 promoter contains four predicted SKN-1 binding sites (wormbase.org). In a genome-wide screen, transgenic SKN-1::GFP showed a high signal on two of the four sites in the memo-1 promoter region (Figure 5H, upper panel; [Niu et al., 2011]), suggesting that SKN-1 regulates memo-1 transcription. Consistent with this, memo-1 mRNA levels are lower in skn-1(zu67) loss-of-function mutants and, conversely, higher in transgenic animals with either SKN-1 overexpression (ldIs007 [SKN-1::GFP]), or constitutive nuclear SKN-1 overexpression (ldIs020 [SKN-1S393::GFP]; [Tullet et al., 2008]), when compared to wild type. These results suggest a model whereby MEMO-1 controls the level of RHO-1 that is bound to BLI-3, and thereby regulates BLI-3 activity (Figure 6). In animals with memo-1 knockdown RHO-1 is free to bind and activate BLI-3/NADPH oxidase, thereby generating an increase in intracellular ROS. These ROS presumably act as a longevity-promoting signal molecule that activates both p38 MAPK and the SKN-1/Nrf1,2,3 transcription factor, which would increase the level of transcripts involved in the oxidative stress response, thus lengthening lifespan. Furthermore, activation of SKN-1 increases the expression of memo-1 (Figure 5H), suggesting a negative feedback loop that regulates ROS generation by the BLI-3/NADPH oxidase (Figure 6) in order to maintain a homeostatic balance. Model of how MEMO-1 activates NADPH oxidase activity to promote oxidative stress resistance and longevity. Under normal conditions, MEMO-1 is complexed with RHO-1/GTPase. 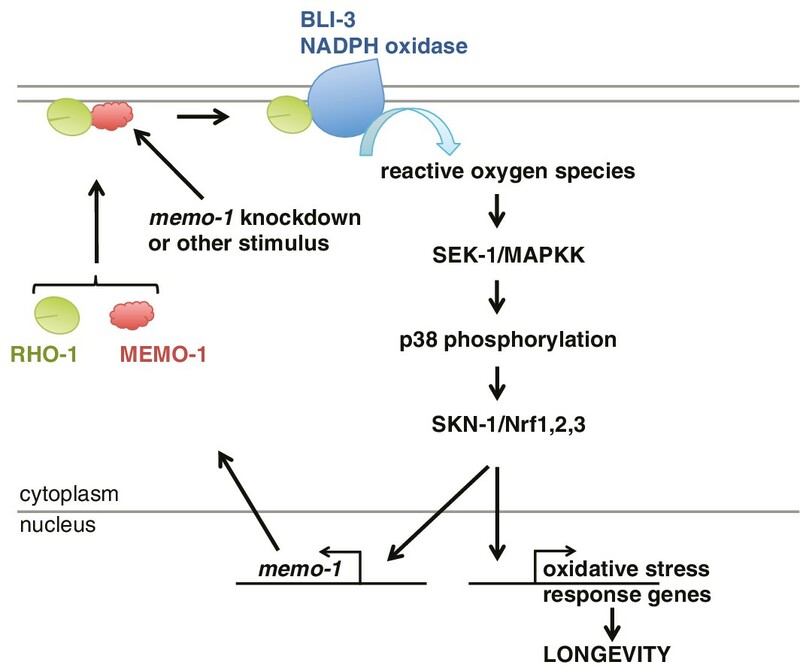 Loss of memo-1 frees RHO-1 to enhance BLI-3/NADPH oxidase activity to generate localized ROS, which activates p38 MAPK signaling to SKN-1 to transcribe genes important for oxidative stress resistance and longevity. Similar to ERBB2 recruiting Memo1 in breast cancer cells (Marone et al., 2004), we speculate that in C. elegans a stimulus might activate a cell-surface receptor to recruit MEMO-1, thereby freeing RHO-1 to promote BLI-3/NADPH oxidase activity. Because SKN-1 also transcribes memo-1 (Figure 5H) resulting in a negative feedback loop to shut off BLI-3/NADPH oxidase activity, memo-1 RNAi or mutation breaks this feedback loop, resulting in continuously enhanced BLI-3 activity. NADPH oxidases are a major source of cellular ROS (Krause, 2007), but the possibility that the ROS they produce might influence longevity-associated mechanisms has not been explored. In C. elegans, we have identified a pathway that regulates ROS production via an increase in BLI-3/NADPH oxidase activity. We show that MEMO-1 is a negative regulator of BLI-3, and that its loss enhances an interaction between RHO-1 and BLI-3, thereby stimulating the activity of this NADPH oxidase. As a result, ROS are generated that activate p38 and induce nuclear accumulation of SKN-1/Nrf, and thereby promote stress resistance and longevity in this metazoan. Thus, our data identify a regulatory mechanism that controls ROS generation, which is sufficient to promote longevity; they also show that this mechanism initiates an adaptive response similar to that triggered by transient ROS increases generated from the mitochondria. Our findings support and broaden the emerging hypothesis that directed ROS generation, e.g., in response to specific stimuli or in particular subcellular locations, acts as a homeostatic signal that can have substantial benefits (Hekimi et al., 2011; Shadel, 2014; Ristow and Schmeisser, 2014). The mitochondria generate ROS as a by-product of oxidative phosphorylation, and thereby integrate the rate of metabolism with the animal’s physiology. The beneficial effects of low-dose mitochondrial ROS on healthspan and lifespan arise from a hormetic adaptation to mild stress (Hekimi et al., 2011; Shadel, 2014; Ristow and Schmeisser, 2014). Similarly, it was shown recently that ROS production arising from perturbed ER redox homeostasis leads to a protective response that increases lifespan (Hourihan et al., 2016). In each of these examples, mutants that lack the capacity to detoxify ROS (e.g. skn-1(-) and sek-1(-)) exhibit a shortening of lifespan, indicating that these ROS are detrimental in the absence of this response (Schmeisser et al., 2013b; Weimer et al., 2014; Schmeisser et al., 2013a; Hunt et al., 2011; Saul et al., 2010; Hourihan et al., 2016). By contrast, ROS generated by the BLI-3 NADPH oxidase did not further shorten the lifespan of memo-1 mutant animals that lack the oxidative stress response genes skn-1 and sek-1 (Figure 2A,B and G). This suggests that the health benefits from NADPH oxidase-generated ROS are initiated by a signaling cascade in the absence of an adaptive stress response to damage, and therefore arise from a ROS signal per se. A variety of extracellular and intracellular stimuli induce NADPH oxidase activation (Lambeth and Neish, 2014). The roles of these enzymes in innate immunity are well-documented, and in C. elegans the NADPH oxidase BLI-3 produces ROS in response to pathogen infection, leading in turn to activation of NSY-1/ASK1/MAPKKK, SEK-1/MAPKK, PMK-1/p38 MAPK and SKN-1/Nrf (Hoeven et al., 2011). BLI-3 and p38/SKN-1 are also activated by stress from sodium arsenite (Hourihan et al., 2016). Importantly, interactions with various cell surface receptors results in NADPH oxidase activation. These include not only receptors involved in immunity signaling but also growth factor receptors (Lambeth and Neish, 2014), with the best-described paradigm being the dependence of EGFR signaling on ROS that are produced by NADPH oxidase in response to EGF binding (Truong and Carroll, 2012). Our results suggest that all of these signaling events have the potential to impact upon SKN-1/Nrf, and potentially other ROS-responsive mechanisms that influence longevity. Now that we have established MEMO as a regulator of NADPH oxidase, it will be of interest in the future to investigate whether MEMO might be involved in controlling these signaling pathways. Another exciting subject for future study will be to elucidate how MEMO-1-responsive ROS signals generated by NADPH oxidase act upon the p38 MAPK pathway. Interestingly, NSY-1 and its mammalian homolog ASK-1 are each regulated for activation through cysteine oxidation for activation (Nadeau et al., 2007; Hourihan et al., 2016), suggesting that this kinase may respond directly to BLI-3-generated ROS. Furthermore, signaling from NADPH oxidases has been shown to activate Nrf2-mediated transcription in mammals (Sekhar et al., 2003; Hecker etal., 2014; Brewer et al., 2011; Segal et al., 2010; Schröder et al., 2012; Nlandu Khodo et al., 2012; Hourihan et al., 2016); and RhoA GTPase activity has been linked to NADPH oxidase activation and p38 MAPK signaling (Kim et al., 2005). Interestingly, inducing endoplasmic reticulum (ER) stress in HUVEC cultures leads to active RhoA translocation to the ER membrane, resulting in Nox4-dependent ROS generation at this location (Wu et al., 2010). Taken together, these findings show a possible conservation of an overall signaling pathway through which mechanisms controlled by MEMO and RhoA activate NADPH oxidase-mediated ROS signaling to act on p38 MAPK and SKN-1/Nrf. Breast cancer cells that lack Memo1 fail to migrate upon stimulation with growth factors (Marone et al., 2004). Moreover, it was shown that Memo1 is required for the localization of GTP-bound RhoA at the plasma membrane (Zaoui et al., 2008), an essential step in the process of cell migration. Forcing RhoA to be constitutively membrane-bound rescued the migration phenotype of cells lacking Memo1 (Zaoui et al., 2008), suggesting a conserved and biologically relevant interaction between Memo1 and RhoA. We have tried a similar experiment in C. elegans to determine whether adult-specific expression of constitutively active RHO-1(G14V) could by-pass memo-1 function. We predicted that adult-specific overexpression of RHO-1(G14V) would activate BLI-3/NADPH oxidase leading to an increased lifespan. Unfortunately, overexpression of the constitutively active RHO-1(G14V) GTPase specifically during adulthood causes lethality within 2-4 days (data not shown; [McMullan and Nurrish, 2011]). The activity of NADPH oxidase has been shown to be essential during cell migration (Stanley et al., 2014; Hurd et al., 2012). Interestingly, Memo1 has been linked to NADPH oxidase activity in breast cancer cells (MacDonald et al., 2014), however the exact mechanism underlying these results, as well as a role for RhoA, has not been established and is likely to be context-dependent. Memo1 is a highly conserved protein with homologues found in bacteria through vertebrates (Schlatter et al., 2012). The most conserved portion of Memo1 is the domain that has three conserved histidine residues. These three histidines, which are present in the C. elegans protein, are required for copper binding, and for Memo1’s copper-reducing activity in breast cancer cells (MacDonald et al., 2014). One speculative but exciting possibility for a future study would be to investigate whether MEMO-1 might sense ROS through this metal-binding domain, and whether this might provide a feedback mechanism that regulates this ROS-generating pathway. In the future, it will be important to understand how directed NADPH oxidase activity promotes healthy aging in mammals. In mice, loss of NADPH oxidase activity accelerated aging (Chen et al., 2015; Lee et al., 2011). By contrast, chronic ROS generation by NADPH oxidase has been suggested to promote age-dependent diseases (Krause, 2007), showing that NADPH oxidase and the generated ROS need to be tightly regulated. Our data reveal that transient or low NADPH oxidase-generated ROS act as a signal to re-establish homeostasis during aging, and imply that signals that affect NADPH oxidase activity can also influence longevity. An exciting aspect of our findings is that NADPH oxidase activity is inducible and controllable, suggesting a novel target for therapeutics to promote healthy aging. Caenorhabditis elegans strains were maintained on NGM plates and OP50 Escherichia coli bacteria at 20°C as described in Brenner (1974). The wild-type strain was N2 Bristol (Brenner, 1974). Mutant strains used are described in Wormbase (www.wormbase.org): LGII: let-23(n1045), rrf-3(pk1426); LGIII: daf-2(e1368); LGIV: skn-1(zu67, zu129); LGIV: isp-1(qm150); LGV: memo-1(gk345); LGX: sek-1(km4). Transgenic strains: CL2166 dvIs19 [Pgst-4::GFP; pRF4 rol-6(su1006gf)] (Link and Johnson, 2002), CF702 muIs32 [Pmec-7::GFP; lin-15(+)] II (Ch'ng et al., 2003), LD001 ldIs007 [Pskn-1::SKN-1b/c::GFP; pRF4 rol-6(su1006gf)] (An and Blackwell, 2003), LD1171 ldIs003 [Pgcs-1::GFP; pRF4 rol-6(su1006gf)] (Wang et al., 2010), LD1252 ldIs020 [Pskn-1::SKN-1S393::GFP]; (Tullet et al., 2008), ldEx102 [rol-6(su1006)] (Ewald et al., 2015), jrIs1[Prpl-17::HyPer] (Back et al., 2012b), SJ4100 zcIs13 [Phsp-6::GFP]V (Yoneda et al., 2004), TJ356 zIs356 [Pdaf-16::DAF-16a/b::GFP; pRF4 rol-6(su1006gf)] (Henderson and Johnson, 2001), QZ16 muIs32 [Pmec-7::GFP; lin-15(+)] II; memo-1(gk345) V, QZ25 muIs32 [Pmec-7::GFP; lin-15(+)] II; eri-1(mg366) IV; lin-15b(n744) X, QZ50 jxEx8 [Pmemo-1::GFP; Pmyo-3::RFP]. memo-1(gk345) mutants were obtained from Caenorhabditis Genetics Center (CGC; Strain VC794) and were outcrossed eight times against wild type (N2). The gk345 deletion in memo-1 deletes the transcription initiation ATG from isoform A (C37C3.8a), but not isoform B (C37C3.8b). The gk345 deletion causes a frame shift leading to an early stop codon in isoform B (C37C3.8b), which might express a truncated peptide of 30 amino acids. However, only the first 18 out of these 30 amino acids are shared with the wild-type MEMO-1 protein. Furthermore, the gk345 deletion covers 2 out the five important amino acids of the copper-binding/enzymatic binding site and therefore any possible splice variant might not be functional. This suggests that gk345 deletion could potentially be a null allele of memo-1. Construction of transcriptional fusion of memo-1 promoter with GFP (jxEx8 [Pmemo-1::GFP]). The cis regulatory regions of memo-1/C37C3.8 were amplified by PCR from cosmid C37C3 (Accession number U64857) using memo-GFP fusion primers as described in Hobert (2002). PCR for 5’ cis region of memo-1 (PCR1): Forward primer (memo-GFP-5for) and reverse primer (memo-GFP-5rev-int) that specifically recognizes the 5’ end of the C37C3.8 locus are used to amplify the 5’ cis region of the memo-1 gene and the first 48 amino acids of the b isoform of the gene (3.5 kb). PCR for 3’ cis region of memo-1 (PCR2): Forward primer (memo-GFP-3for:) and a reverse primer (memo-GFP-3rev-int) that specifically recognizes the 3’ end of the C37C3.8 locus are used to amplify the 3’ untranslated region (UTR) and the 3’ cis region of the memo-1 gene (264 bp). PCR3: The green fluorescent protein (GFP) open reading frame (1.4 kb) was amplified from L3691 plasmid (pPD117.01 Fire Lab Vector Kit Documentation 1997. (www.addgene.org)) using fusion primers (gfp-memo-for and gfp-memo-rev). The PCR product from PCR3 was then fused to the 5’ cis memo PCR product from PCR1, as well as to the 3’ cis memo PCR product from PCR2 in a third round of PCR reactions. The resulting two fragments from the third round of PCR reactions are then fused into one final PCR product (Pmemo-1::GFP) in a fourth round of reaction. Primer sequences are found in Supplementary file 3). This fused PCR fragment of Pmemo-1::GFP (50 ng/µl together with 100 ng/µl of Pmyo-3::RFP) was injected into wild-type (N2) worms and three transgenic [Pmemo-1::GFP] lines were obtained, of which one was chosen for analysis (QZ50 jxEx8 [Pmemo-1::GFP; Pmyo-3::RFP]). Overexpression of MEMO::GFP: 35 ng/µl tag-253 fosmid (WRM0639B_H07(pRedFlp-Hgr)(tag-253::S0001_pR6K_Amp_2xTY1ce_EGFP_FRT_rpsl_neo_FRT_3xFlag)dFRT::unc-119-Nat from https://transgeneome.mpi-cbg.de/transgeneomics/index.html) together with 100 ng/µl pRF4 rol-6(su1006gf) was injected into wild-type (N2) worms and four transgenic ldEx112-6 [MEMOfosmid::GFP] lines were obtained, of which one was chosen for picture analysis and CoIP (ldEx112 [MEMOfosmid::GFP; rol-6(su1006gf)]). Overexpression of BLI-3: 5 ng/µl of plasmid pHM363 [BLI-3] (Moribe et al., 2012) together with 100 ng/µl pRF4 rol-6(su1006gf) was injected into wild-type (N2) worms and one transgenic ldEx117 [BLI-3] line was obtained for analysis. Triple transgenic overexpression (BLI-3, DOXA-1, TSP-15): 5 ng/µl of plasmid pHM363 [BLI-3] (Moribe et al., 2012), 5 ng/µl of plasmid pHM327 [DOXA-1::Venus] (Moribe et al., 2012), 5 ng/µl of plasmid pHM106 [HisXp::TSP-15] (Moribe et al., 2012), together with 100 ng/µl pRF4 rol-6(su1006gf) was injected into wild-type (N2) worms and one transgenic ldEx118 [BLI-3, DOXA-1, TSP-15] lines were obtained for analysis. RNAi#1 clone is from Vidal RNAi library (Rual et al., 2004) and RNAi#2 clone is from Ahringer RNAi library (Fraser et al., 2000; Kamath et al., 2003). RNAi bacteria cultures were grown overnight in LB with carbenicillin [100 µg/ml] and tetracycline [12.5 µg/ml], diluted to an OD600 of 1, and induced with 1 mM IPTG and spread onto NGM plates containing tetracycline [12.5 µg/ml] and ampicillin [50 µg/ml]. For empty RNAi vector (EV) plasmid pL4440 was used as control. For double RNAi: bacterial cultures were grown separately and then mixed in a 1:1 ratio, except for combinations with bli-3(RNAi). As reported in Chávez et al. (2009), a 1:10 ratio for bli-3 to other bacteria clone for the double RNAi treatment was used because of the strong bli-3 blistering phenotype. The total level of ROS were measured by using either a small diffusible fluorescent probe (chloromethyl derivative; CM-H2DCFDA; Life Technologies) or with the Amplex Red Hydrogen Peroxide/Peroxidase Assay Kit (Life Technologies) with a protocol adapted from Schulz et al. (2007). Briefly, wild-type eggs were hatched on empty vector (EV) or memo-1(RNAi) food and harvested for assay at larval stage 4 (L4). More than 1000 L4 animals per conditions were harvested into 96-well plates, incubated in 50 µM CM-H2DCFDA for 1 hr and the fluorescent intensity was measured with an excitation wavelength of 485 nm and a 520 nm emission filter. Detection of ROS by Amplex Red was performed according to manufacturer’s instructions and fluorescence was measured with an excitation wavelength of 530 nm and a 590 nm emission filter. Animals were lysed and protein levels were determined using BCA assay (Pierce). The fluorescent intensity was normalized to protein levels and is indicated relative to control. To measure endogenous hydrogen peroxide levels, transgenic jrIs1[Prpl-17::HyPer] worms expressing a HYPER-probe were used as described in Back et al. (2012b). Transgenic jrIs1[Prpl-17::HyPer] animals were treated with RNAi and about 1000 L4 worms were harvested in 96 microtiter well plates. An excitation wavelength of either 490 nm or 405 nm was used to measure oxidized or reduced HyPer probe fluorescence respectively with an emission filter of 535 nm. The animals were harvested and protein levels were determined using BCA assay (Pierce). The fluorescence intensity was normalized to protein and the ratio of oxidized/reduced HyPer levels was calculated using the 405 nm fluorescence as a numerator and the 490 nm fluorescence as the denominator as described in Back et al. (2012b). For GSH treatment, NGM plates containing 5 mM GSH (Sigma) were poured and allowed to dry. The respective E.coli food source was added to each plate and once dry, animals (young adult) were added to the plate and allowed to lay eggs. Nematodes grew for one generation on these plates prior to ROS analysis or GFP scoring. Inhibition of BLI-3 by DPI (Diphenyleneiodonium chloride, Sigma) was performed by treating animals with 80 µM of the compound in M9 solution for 15 min prior to analysis. Removal of mitoROS by the mitochondrial-targeted superoxide scavenger Mito-Tempo (Sigma) occurred by exposing animals to 250 µM of the antioxidant for 2 hr in M9 solution prior to ROS determination. Wild-type eggs were hatched on the respective E. coli food source and harvested for mitoROS analysis at larval stage 4 (L4). As a positive control, wild-type animals were treated with 3 mM Anitmycin A for 2 hr, by top-coating the culturing plates containing the L4 and bacterial food. Approximately 1000 L4 animals per condition were washed and added into each well of a 96-well plate, incubated in 50 µM Mitotracker Red CM-H2XRos (Life Technologies) for 2 hr in the dark on a shaker and the fluorescent intensity was measured with an excitation wavelength of 570 nm and a 610 nm emission filter. Subsequently, animals were lysed and the total protein levels were determined using the BCA assay (Pierce). The level of fluorescence was normalized to protein levels and is expressed relative to control. Adult lifespan was determined either with or without 5-Fluoro-2’deoxyuridine (FUdR), a DNA synthesis inhibitor that blocks progeny production and thus prevents overcrowding. For non-FUdR lifespan assays: About 100 L4 worms per strain were picked on NGM plates containing OP50 bacteria. Worms were transferred every day or every other day on fresh NGM OP50 plates until progeny production ceased as described in Kenyon et al. (1993), Alcedo and Kenyon (2004). For FUdR lifespan assays: About 100 L4 worms per strain were picked on NGM plates containing OP50 bacteria. The next day, worms (day-1-adults) were transferred onto either NGM plates containing 400 µM FUdR and OP50 bacteria or RNAi bacteria (or plates that also contained 5 mM GSH, or OP50 that were heat-killed by 1 hr of incubation at 75°C before seeding). Animals were scored every day or every other day. All lifespans were plotted with L4 as time-point = 0. Animals were scored as dead animals if they failed to respond to prodding. Exploded or bagged animals and animals that ran off the plate were excluded from the statistics. The estimates of survival functions were calculated using the product-limit (Kaplan-Meier) method. The log-rank (Mantel-Cox) method was used to test the null hypothesis and calculate P values (JMP software v.9.0.2.). For arsenite stress tolerance assay: about 50 L4 worms per strain/ condition were picked onto fresh OP50 plates. The next day, 10–12 day-one worms were picked into 24 well plates containing 50 µl physiological M9 Buffer in quadruplicates for each strain and condition (four wells). Then when all worms were set up, 1 mL M9 buffer with either a final concentration of 5 mM or 10 mM sodium arsenite (Sigma-Aldrich) was added to three wells per strain and condition. In the remaining well only 1 mL M9 buffer was added as a control. The survival was scored every hour until all died. Exploded animals were excluded from the statistics. For tert-Butyl hydroperoxide (t-BOOH) stress tolerance assay: about 80 L4 worms per strain/ condition were picked onto fresh OP50 plates. Three days later, 20 day-three worms were picked onto NGM plates containing 15.4 mM t-BOOH (Sigma-Aldrich). Because worms try to avoid the t-BOOH, they leave the plate. For the first two hours worms were continually repositioned into the middle of the plate until they ceased crawling. Survival was scored every hour. Exploded animals or animals damaged from moving were censored from the statistics. For both arsenite and t-BOOH the estimates of survival functions were calculated using the product-limit (Kaplan-Meier) method. The log-rank (Mantel-Cox) method was used to test the null hypothesis and calculate P values (JMP software v.9.0.2.). Both oxidative stress tolerance assays are described in more detail at Bio-protocol (Ewald et al., 2017). RNA was isolated with Trizol (TRI REAGENT Sigma), DNAse-treated, and cleaned over a column (RNA Clean and Concentrator ZYMO Research). First-strand cDNA was synthesized in duplicate from each sample (Invitogen SuperScript III). SYBR green was used to perform qRT-PCR (ABI 7900). For each primer set, a standard curve from genomic DNA accompanied the duplicate cDNA samples (Glover-Cutter et al., 2008). mRNA levels relative to N2 control were determined by normalizing to the number of worms and the geometric mean of three reference genes (cdc-42, pmp-3, and Y45F10D.4; [Hoogewijs et al., 2008]). At least two biological replicates were examined for each sample. For statistical analysis, one sample t-test, two-tailed, hypothetical mean of 1 was used for comparison using Prism 6.0 software (GraphPad). For each assay, two investigators scored transgenic animals blindly after mounting on slides or with stereomicroscope essentially as described in Robida-Stubbs et al. (2012). Pgcs-1::GFP (Figure 1I) and Pgst-4::GFP (Figure 1G–H, 3I, 4C and 5A, Figure 5—figure supplement 1): At the L4 stage, ldIs003 [Pgcs-1::GFP] transgenic animals were mounted on slides and GFP fluorescence in the intestine was scored using Zeiss AxioSKOP2 microscope at 40x as described in Wang et al. (2010). None: no GFP in intestine. Low: only anterior or posterior intestine with GFP. Medium: both anterior and posterior intestine with GFP but no GFP in the middle of the intestine. High: GFP throughout the intestine. P values were determined by Chi2 test. Pgst-4::GFP: At the first day of adulthood stage, transgenic dvIs19 [Pgst-4::GFP] (Link and Johnson, 2002) animals were scored using stereoscope described in Wang et al. (2010). None: no GFP in intestine. Low: only weak anterior or posterior intestine with GFP. Medium: both anterior and posterior intestine with strong GFP but no or weak GFP in the middle of the intestine. High: GFP throughout the intestine. P values were determined by Chi2 test. SKN-1::GFP nuclearlocalisation assay (Figure 2D and 4H): Transgenic ldIs007 [Pskn-1::SKN-1b/c::GFP] (An and Blackwell, 2003) L4 animals were mounted on slides and intestinal GFP scored as described in Robida-Stubbs et al. (2012) by using a Zeiss AxioSKOP2 microscope. none = no GFP observed in intestinal nuclei; low = some intestinal nuclei show GFP; medium = more than half of the intestinal nuclei show GFP; high = all intestinal nuclei show GFP. SKN-1::GFP is constitutively expressed in ASI neurons (An and Blackwell, 2003) and we did not observe any noticeable change of SKN-1::GFP expression in ASI upon memo-1 knockdown. P values were determined by Chi2 test using Prism 6.0 software (GraphPad). Approximately 5000 mixed-stage nematodes were sonicated in IP buffer (50 mM Tris-HCl (pH 7.5), 150 mM NaCl, 1% NP-40, 2 mM EDTA and protease inhibitor) and kept on ice for 30 min before being centrifuged for 20 min at 13,000x g. The supernatant was pre-cleared with 50 µl slurry of Protein-G beads for 30 min at 4°C, centrifuged for 5 min at 2000 x g and the beads were removed. The supernatant (1 mg) was incubated with 2 μg of antibody overnight at 4°C. The following day, 50 μl slurry of Protein G beads was added to the lysate for 2 hr at 4°C after which the beads were washed three times in IP buffer and eluted in 2 x sample buffer (+2ME). SDS-page was performed with 10% Bis-Tris gels (Invitrogen) and proteins were transferred to nitrocellulose membranes (Pierce). Western blot analysis was performed under standard conditions with antibodies against GFP, RHO-1 (gift from A. Sugimoto), Tubulin (Cell signal Tech. ), BLI-3 (gift from E. Mekada), and Phospho-p38 (Cell signal Tech.). HRP-conjugated rabbit anti-mouse and goat anti-rabbit secondary antibodies were purchased from Sigma and proteins were detected by enhanced chemiluminescence (Pierce). Quantification of protein levels was determined using ImageJ software and normalized to loading control. ROS in aging Caenorhabditis elegans: damage or signaling? Oxidative Medicine and Cellular Longevity 2012:1–14. Free Radical Biology & Medicine 52:850–859. Free Radical Biology and Medicine 88:290–301. Free Radical Biology and Medicine 51:205–215. The Journal of Biological Chemistry 290:14692–14704. Nature Reviews Molecular Cell Biology 8:813–824. The Journal of Cell Biology 154:879–892. Advances in Enzymology and Related Areas of Molecular Biology 63:69–172. Nature Structural & Molecular Biology 15:71–78. Trends in Cell Biology 21:569–576. Trends in cell biology 22:107–115. Antioxidants & Redox Signaling 19:89–101. Experimental & Molecular Medicine 37:575–587. Annual Review of Pathology: Mechanisms of Disease 9:119–145. Journal of Biological Chemistry 283:26217–26227. Journal of Cell Science 122:787–797. The Journal of biological chemistry 263:17205–17208. Annals of the New York Academy of Sciences 959:330–340. Molecular Biology of the Cell 18:3903–3913. Journal of the American Society of Nephrology 23:1967–1976. Journal of Molecular Biology 302:205–217. The Journals of Gerontology Series A: Biological Sciences and Medical Sciences 65:626–635. Trends in Cell Biology 23:409–420. Antioxidants & Redox Signaling 20:2026–2042. FASEB Journal : Official Publication of the Federation of American Societies for Experimental Biology 5:98–103. Molecular and Cellular Biology 30:3553–3568. Journal of Cell Science 117:4055–4066. The Journal of Cell Biology 183:401–408. Thank you for submitting your article "NADPH-oxidase-mediated redox signaling promotes oxidative stress resistance and longevity through Memo" for consideration by eLife. Your article has been favorably evaluated by Tony Hunter (Senior Editor) and three reviewers, one of whom, Andrew Dillin (Reviewer #1), is a member of our Board of Reviewing Editors. In this body of work the authors begin to explore how an interactor in the ErbB-2 tyrosine kinase pathway might contribute to aging in the nematode C. elegans. 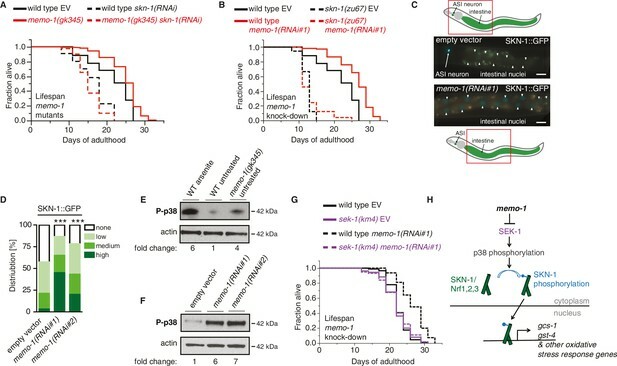 The closest ortholog of the mediator of ErbB2-driven cell motility factor, memo-1, results in increased lifespan when knocked down or mutated. This appears independent of dietary intake, insulin/IGF1 pathway or germline mediated responses. The interaction with the mitochondrial ETC pathway is sparsely explored and detailed more below. Transcript analysis indicates that several antioxidant genes are induced by memo-1 RNAi and lead to the hypothesis that skn-1 might play a role in the memo-1 mediated lifespan response. Genetic interaction studies and nuclear localization of skn-1 support this hypothesis. Furthermore, ROS levels using 3 different sensors all indicate that ROS levels are increased. GSH treatment also blocks memo-1 (RNAi) lifespan. However, the authors then go on to interrogate whether the ROS levels originate from mitochondria using mitotracker red and MitoTempo, both of which provide negative results without positive controls. With a lack of correlation of ROS from mitochondria, the authors speculate that ROS is generated from another source and hypothesize that NAPDPH oxidase could be the culprit. Genetic studies of bli-3 (NADPH oxidase) RNAi confirms their hypothesis in test of ROS levels and longevity. Importantly, bli-3 overexpression increases ROS and increases lifespan. Understanding how bli-3 is regulated by memo-1, the authors query orthologes of known mammalian interactors of memo-1 in a screen and uncover that loss of rho mirrors the effects seen with bli-3 (although overexpression studies of rho are not performed). 1) Because of the role of this pathway in innate immunity, the authors need to explore if the lifespan effects are due to bacterial infection/interaction. It is suggested to perform the lifespan extending experiments on dead bacteria (memo-1 loss and bli-3 overexertion). 2) The involvement of mitochondrial produced ROS is not well controlled and we suggest that positive controls in the measurements are needed. isp-1 mutant animals are documented to have increased ROS and are a good place to start. 3) The involvement of the ETC longevity pathway is not explored and it is suggested to test bli-3 RNAI on cco-1(RNAi) treated animals or isp-1 mutant animals for lifespan extension. The same is true for memo-1 loss. 4) The closing experiments involving rho are not fully executed and do not fully test the model proposed. Does loss of rho block the ROS accumulation in memo-1(-) animals? Does loss of rho specifically reduce the lifespan of memo-1(-) or bli-3(o/e) animals? Does overexertion of rho extend lifespan, and is this bli-3 dependent? Finally, the title needs to include C. elegans. We thank the reviewer for pointing this out. We have repeated mitochondrial ROS assays and as a positive control used Antimycin A, which binds cytochrome c reductase and thereby disrupts the proton gradient across the inner mitochondrial membrane, which results in the formation of mitochondrial ROS. For 2 of the 5 biological independent trials, we split our animal populations in half and used the corresponding half to measure hydrogen peroxide in the supernatant with Amplex Red, in parallel to the mitochondrial ROS measurements with MitoTracker Red CMXRos, as we did in the previous experiments. Antimycin A increased ROS levels, as measured with both MitoTracker Red and Amplex Red. Mutants that lack memo-1 showed an almost 2-fold increase in ROS measured with Amplex Red, but showed no significant difference in mitochondrial ROS compared to wild type measured with MitoTracker Red. This argues that the mitochondria are not the source of ROS in animals that lack memo-1. We included these data in Figure 4—figure supplement 1. 4) The closing experiments involving rho are not fully executed and do not fully test the model proposed. Does loss of rho block the ROS accumulation in memo-1(-) animals? Knockdown of rho-1 in memo-1(-) mutants partially suppressed the ROS accumulation in memo-1(-) mutants (Figure 5C). The partial suppression might be because RNAi does not cause a complete loss of expression, and because wild type animals fed rho-1 RNAi exhibited higher ROS levels in 2 out of 3 trials. This suggests that rho-1 knockdown may, through an unknown mechanism, increase ROS on its own. Does loss of rho specifically reduce the lifespan of memo-1(-) or bli-3(o/e) animals? In two independent trials, adulthood rho-1(RNAi) completely suppressed memo-1(-) mutant longevity (Figure 5D, Supplementary file 1)Furthermore, adulthood rho-1(RNAi) partially suppressed longevity of BLI-3 overexpressing animals (1 independent trial; Figure 5E, Supplementary file 1). This indicates that rho-1 makes a major contribution to bli-3-mediated longevity, and supports our models. The partial dependence could be due to the fact that rho-1 function is unlikely to be completely eliminated by rho-1 RNAi treatment during adulthood. RHO-1 has many important functions, and null mutants of rho-1 are embryonic lethal. To bypass rho-1 requirements during development, Rachel McMullan and Stephen Nurrish have generated transgenic animals that can drive an inhibitor of endogenous Rho (C3 transferase) by an inducible heat-shock promotor. Unfortunately, adult-specific expression this Rho inhibitor caused lethality within 2-3 days (McMullan and Nurrish, 2011). Therefore, we were not able to investigate a complete loss of rho-1 function during adulthood. We incorporated these data and added the following sentences in the manuscript. Does overexertion of rho extend lifespan, and is this bli-3 dependent? Overexpression of the constitutively active RHO-1(G14V) GTPase specifically during adulthood causes lethality within 2-4 days (McMullan & Nurrish 2011). Dr. Stephen Nurrish kindly gave us these transgenic animals (QT54 nzIs1 [Phsp-16.2::RHO-1(G14V)]), in which RHO-1(G14V) expression is driven by a heat-shock promoter. We tried very hard to establish conditions whereby weaker activation of the heat-shock promoter (e.g. at 25oC) would lead to lower levels of RHO-1(G14V) expression that might not be toxic, but even under these conditions RHO-1(G14V) overexpression during adulthood shortened lifespan (not shown). This result is not surprising given the many functions of RHO-1 in cellular architecture and signaling. We hope that the reviewer will agree that this result does not contradict our models, particularly in light of our other data supporting the involvement of RHO-1 in BLI-3-mediated longevity. C. elegans is now included in the title. We thank Bart P. Braeckman for jrIs1 strain, Hiroki Moribe for bli-3, doxa-1, and tsp-15 plasmids and BLI-3 antibody, Asako Sugimoto for RHO-1 antibody, Alcedo, Blackwell, and Hynes lab members for helpful discussions. VC794 strain was provided by the CGC, which is funded by the NIH office of Research Infrastructure Programs (P40 OD010440). Supported by funding from the Novartis Research Foundation and the Swiss National Science Foundation 310030 A-121574 and 310030B-138674 to NEH and PBSKP3_140135, P300P3_154633, and PP00P3_163898 to CYE and NIH GM062891 and GM094398 to TKB. © 2017, Ewald et al.